Roman Carthage was built between 49 to 44 BC, in the time of Julius Caesar, on the site of the former Punic capital which had been destroyed a century earlier. At one point it may have been the 4th largest city in the Empire, and was the principal city in Africa, which in turn was major supplier of food to the rest of the Roman world. Its main attraction was its amphitheatre, which had a capacity of up to 30,000 people (bottom centre). The city’s fortunes rose and feel during the following centuries. It would become the capital of the Byzantine Exarchat of Africa in 533. However, the city was destroyed a century and a half later during the Islamic conquest of Hassan Ibn al Numan in 698. 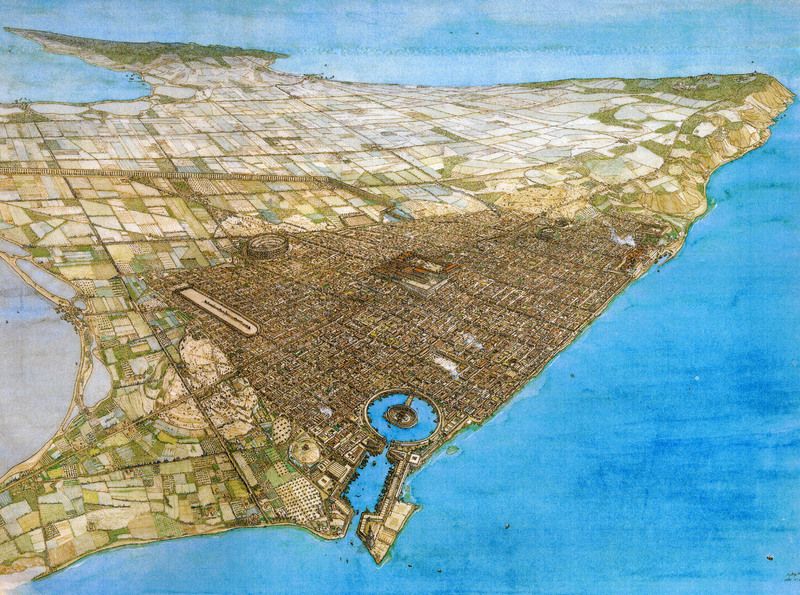 Today, Carthage is a suburb of Tunis, and has a population of just over 20,000, a far cry from the former capital of an Empire. Fortunately, many of the former Roman monuments are still visible, and possible to visit, today. If you’d like to see other Roman Empire maps have a look at Roman City of Londinium Around AD 200, An Incredibly Detailed Map of the Roman Empire At Its Height in 211AD and Roman Empire GDP Per Capita Map.